This is a very special entrée in Brazil , with an irresistible flavour ! Preheat oven to 350°F (180°) or use the broiler inside the oven. 1) In a skillet, heat olive oil and sauté onions, garlic and bell peppers ( red and green ) until soft. Stir in crab meat and cook 3-5 minutes. Add tomatoes for about 5 minutes. 2) Add coconut milk, salt, pepper, cooking about 3-5 minutes. Stir in parsley. Remove from heat. 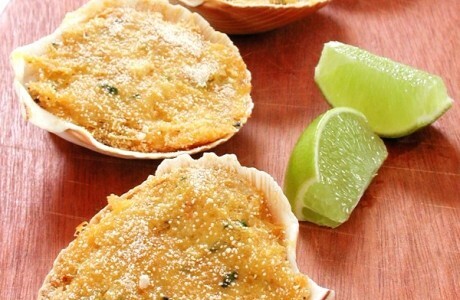 3) Fill the shells ( or a bowl) with the crab mixture and top with bread crumbs mixed with Parmesan cheese. Bake for 15-20 minutes or until lightly brown. Sprinkle lime juice when serving.